.....saving my family from a life without pie, one week at a time. 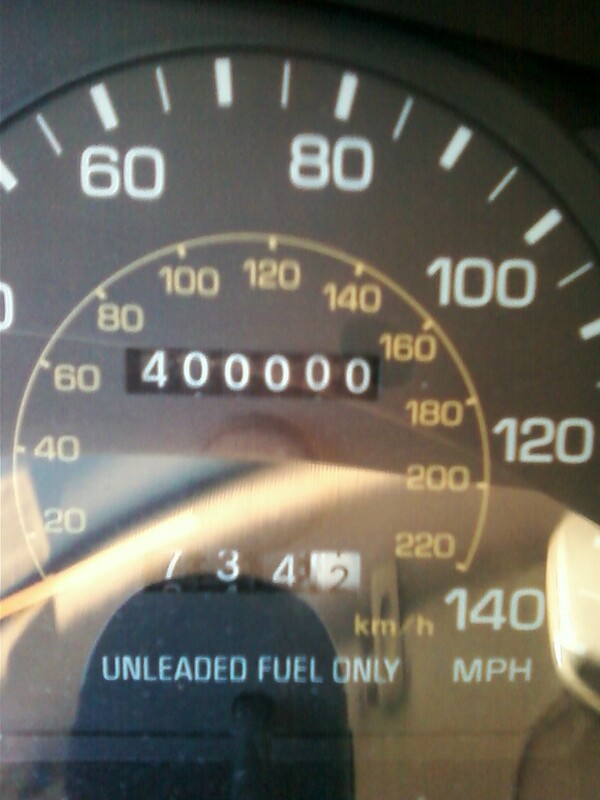 My sister sent me this photo she took of the odometer in her car when it turned 400,000 miles just the other day. No extra zeroes in that number. That’s correct. Four-fifths of the way to a half-million miles. And me? I’m green with envy. I mean, how many people out there can say they have 400,000 miles on their car, 385,000 of which they put on it all by themselves? (Not including Ferris Bueller. And he didn’t even go anywhere.) But, that’s what you get when you take excellent care of your car, people. My sister is the only person I know who actually waxes her car by hand and follows the maintenance schedule in the owner’s manual to a T. Contrary to the popular belief of most men, those manuals really are worth reading. What does all this have to do with chicken pot pie? Well, it doesn’t come with an owner’s manual, unless you count the recipe. But chicken pot pie can definitely get you some mileage. I mean, how many dishes out there can you serve without a crust and still call it a pie? (Okay, not counting Boston Cream Pie.) That’s the point. You can serve chicken pot pie pretty much any way you want and still call it pie. I prepared this chicken pot pie over the weekend, and it was the perfect answer to a bitterly cold January day. My friend, Jill, gave me the recipe several months ago, and I’ve made it three times already. I love that there is no canned soup in it, and even so, it’s still just as simple. Jill makes hers with top and bottom pastry crusts, but I changed it a little and used a biscuit topping instead. I love the buttery goodness of the biscuits with the creamy taste and texture of the chicken filling. Definitely comfort food to warm you, body and soul. Dare I say it? Warm your engine and get some mileage with this chicken pot pie, no matter how you make it. In skillet, melt butter over medium heat. Add onion and cook for 2 minutes or until tender. Stir in flour, salt, and pepper until well blended. Gradually stir in chicken broth and milk, stirring constantly until mixture is bubbly and thick. Add chicken and vegetables. Remove from heat and pour into greased 9” square (or larger) baking dish. In large bowl, combine flour, baking powder, sugar, salt and cream of tartar. Cut in butter until mixture resembles coarse crumbs; stir in milk just until moistened. Turn onto a lightly-floured surface; knead 8 to 10 times. Pat or roll out to ½-inch thickness. Cut with 2 ½-inch biscuit cutter. Place biscuits over chicken mixture in baking dish. Bake, uncovered, at 400° for about 20 minutes or until biscuits are golden brown. Check out all the great recipes at these Linky Parties! Oh, this looks soooo yummy! I think I will put some mileage on this recipe. Love this post! ~ the "Cam-Fam"
I love Pies! =) this looks really good!! Im your newest follower from Miz Helens Country Cottage. Glad to have you here, thanks for visiting! I tried this recipe and it turned out great! I substituted turkey for the chicken and added sage and thyme to the filling! It was the perfect supper on a cold winter's night! I'll have to try adding the sage and thyme next time! Thank you so much for the honor, Miz Helen! This looks amazing! I make chicken pot pie a lot, but I always guess at what to put inside. I'm definitely trying this recipe out next time. Determined to prevent my family from enduring the hardship of a life lived without pie, I'm making a pie every week while continuing to master the art of pie baking. Join me as I share some recipes for Pie on Sunday.